This article is about the town in Surrey. For other uses, see Woking (disambiguation). Not to be confused with Wokingham. Woking (/ˈwoʊkɪŋ/ WOH-king) is a large town in northwest Surrey, England. It is at the southwestern edge of the Greater London Urban Area and is a part of the London commuter belt, with frequent trains and a journey time of approximately 24 minutes to Waterloo station. Woking is 23 miles (37 km) southwest of Charing Cross in central London. Woking town itself, excluding its narrowly contiguous Built-up Area which extends from West End to West Byfleet, has a population of 62,796, and the UK Government has recorded its Built Up Area as 5% more populous than its Borough with 105,367 residents in 2011, the highest in the county. Though Woking's earliest written appearance is in the Domesday Book, it is mentioned as the site of a monastery in an 8th-century context, as Wochingas. In the Domesday Book it appears as Wochinges, being held in 1086 by King William the Conqueror, Walter FitzOther, Constable of Windsor Castle, and Ansgot and Godfrey from Osbern FitzOsbern, then bishop of Exeter. Modern Woking was formed in the area to the south of the Basingstoke Canal (opened in 1794) around the railway station, built in 1838 at the junction between lines to London, the south coast, and the south-west of England, and the private railway to Brookwood Cemetery, which was developed by the London Necropolis Company as an overflow burial ground for London's dead. As a result, the original settlement 1 mile to the south-east, on the River Wey, became known as "Old Woking". Later, Woking Crematorium at St John's became the first crematorium in the United Kingdom. 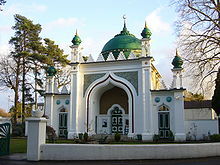 The first purpose-built mosque in the UK, the Shah Jahan Mosque on Oriental Road, was commissioned by Shahjehan, Begum of Bhopal (1868–1901), one of the four female Muslim rulers of Bhopal who reigned between 1819 and 1926. The Martinsyde aircraft company operated a major aircraft factory in the town during World War I and used nearby Brooklands Aerodrome for test flying and deliveries, but it was closed in the mid-1920s. This site was then the home of the engineering firm James Walker & Company for many years. Known as 'The Lion Works', this area was finally redeveloped in the 1990s into today's Lion Retail Park. This was a £40 million project to take hundreds of Woking homes away from the flood plain of the Hoe Stream. It has also provided new community facilities and roads. Woking Borough Council had been planning this scheme, which was approved in September 2010, for over 20 years. It was being run in conjunction with the Environment Agency. The Council has received finance from: the Public Works Loan Board; a number of grants, including £3.7 million from the Environment Agency; proceeds from the sale of new homes and of other assets. The Council expects the scheme to be fully funded by 2014 with no ongoing costs incurred by the Council. The scheme was completed on schedule in 2012. The constituency of Woking has historically been a Conservative safe seat, with the Liberal Democrats being the principal opposition in the last five general elections. Its current Member of Parliament is Jonathan Lord. Elections to the borough council take place in three out of every four years, with one-third elected in each election. The election in 2011 gave the Conservatives an overall majority of seats for the first time in 20 years. The current Mayor of the borough is councillor Cllr Graham Cubdy. In 2010 the council elected councillor Mohammed Iqbal as the first Asian Mayor of Woking. Several combined heat and power stations provide district heating and electricity, and electricity is also provided by a combination of hydrogen fuel cells and solar cells dispersed throughout the borough. These are linked via an innovative private electricity distribution system operating completely off the public power grid. In order to do this, the local government laid new power lines to all locations on the Woking sustainable community energy system (due to Department of Trade and Industry regulations). Should the public power grid fail, central Woking would continue to have an energy supply. The cost for providing this is approximately UK£0.01/kWh less than for public electricity. It has been reported that the borough saves UK£974,000 a year in energy costs if the installation costs are ignored. By March 2004 the initiatives had also cut the borough's carbon emissions by 17.24% and those of the council by 77.4%. Albion Square canopy was built in 2007, following local council approval three years earlier. It was equipped with over 35,000 photovoltaic cells laminated in 272 glass panels to collect sunlight and convert it into energy. It had a peak electrical output of 81 kWp. It was demolished in 2018. In October 2013 the council confirmed it would implement the Euro 5 environmental emissions standard for taxis and licensed vehicles in the borough, and that the more stringent Euro 6 standard would be introduced in 2022. Woking postal area has several villages, including: Knaphill, Horsell, Hook Heath, Mount Hermon, Barnsbury, Maybury, Sheerwater, Goldsworth Park, St John's, Pyrford, Kingfield, Westfield and Ridgway, some being contiguous which can be described now as suburbs. Further villages are: Old Woking traditionally a separate village with its own large conservation area verging towards the Wey, Mayford; Bisley and Sutton Green to the south nearer the border between Woking and Guildford and West Byfleet to the east is a post town with Byfleet and adjoins to the north-east. The Barnsbury Estate is a housing estate of approximately 400 households. Begun in 1936, it is a self-contained estate of bungalows, housing and flats mostly built in the 1950s along with several small shops. Barnsbury is bordered by the Hoe Valley south of Woking straddling the A320. As part of Woking's proposed Priority Homes PFI submission, back gardens of a significant number of houses were at risk of development. From January to September 2007 this resulted in an extensive community engagement to see if and how these back gardens could be used for development. The scheme was eventually cancelled. Barnsbury also has a primary school. Most of Barnsbury's students now attend the newly built Hoe Valley School for their secondary education. In the 1800s the London Necropolis Company acquired land here on a prospective basis but built Brookwood Cemetery instead; no suitable agent of could be found to oversee the sale of the third portion of excess land at Hook Heath and as a consequence Cyril Tubbs ensured its retention and oversaw its development himself. The London Necropolis society decided to take action. Over the 1890s the site was subdivided into plots for large detached houses, and a golf course was built to attract residents and visitors. [a] The LNC redeveloped its lands at Hook Heath into housing and a golf course, creating a new suburb of Woking and providing a steady income from rentals. Woking, along with the majority of the British Isles experiences a maritime climate, characterised by cool summers and mild winters. The nearest weather station for which data is readily available is Wisley, approximately 6 km east of Woking. Temperature extremes recorded in the area range from 37.8 °C (100.0 °F) during August 2003 down to −15.1 °C (4.8 °F) during January 1982. The weather station also held the UK July record high of 36.5 °C (97.7 °F) from 2006 until 2015. Woking is a multicultural town, according to the Office for National Statistics, based on 2004 estimates, 89.5 per cent of the 62,796 inhabitants of Woking were white, with 84.15 per cent White British, 1.37 per cent White Irish and 5.76 per cent classified as Other White. Some 6.5 per cent are of South Asian descent, with Pakistanis making up 5.3 per cent of Woking's population (compared to 0.73 and 1.44 for the South East and the UK respectively), followed by Indians at 1.2 per cent. 0.50 per cent of Woking's population are Black which compares with 2.3 per cent nationally. 1.37 per cent of Woking residents are of mixed race, leaving 2.0 per cent belonging to other ethnic groups. There has long been a large tightly-knit Italian community in Woking, most of whom originated from the Sicilian town of Mussomeli. The majority of the original arrivals worked in the Britax factory in Byfleet. Others worked on the mushroom farms in Chobham or for the James Walker company. Many started their own landscaping or ice cream businesses. St Dunstan's Catholic Church in Woking holds masses in Italian. The Italian population in Woking, including second and third generation members, number between two and three thousand. There is a large Pakistani population in Woking, centred on the suburbs of Maybury and Sheerwater, near the Shah Jahan Mosque. This partly originates from workers at the then nearby Sorbo Rubber factory. Recently there has been an influx of eastern European immigrants, mostly from Poland. Many Nepalese are also now settling in the suburbs of Woking as part of the Aldershot overspill. Woking has a modern and successful economy. The local working population is characterised by educational attainment levels well above the UK average. The number of jobs in the borough in the managerial, professional and technical sectors is around 50%, 7% above the UK average. Local Employment is largely in the private sector - Woking is one of the districts in the UK least reliant on Public Sector employment. The largest employer in Woking is the McLaren Group. The group is responsible for both McLaren Racing, which fields the McLaren Formula One racing cars (currently driven by Carlos Sainz Jr. and Lando Norris); and McLaren Automotive, builder of the classic McLaren F1 and Mercedes-Benz SLR McLaren supercars, and now manufacturing the McLaren P1, McLaren 650S and McLaren 12C high-performance sports cars. During 2010 and 2011 the McLaren technology centre received a £50million extension, which was opened by David Cameron. Companies with global headquarters in Woking include chemical and assembly materials company Alent plc and Ambassador Theatre Group, a major international theatre organisation. Until it was acquired by Anheuser-Busch InBev with its corporate HQ in Leuven, Belgium, the corporate HQ of multi-national SABMiller was in Woking. The office was still open in early 2017, and would remain open for a transitional period, but is expected to be closed afterwards. Woking railway station is one of the busiest commuter stations in the London commuter belt, and Woking's position along the M25 motorway facilitates commuting both into London and throughout the Home Counties. There is a large concentration of office accommodation in Woking town centre. Employers from the IT, FMCG, Engineering Services and Charities sectors are particularly well represented and provide a large number of highly skilled jobs. Significant local employers include Fidessa, Capgemini, Mouchel, Petrofac, John Wood, SABMiller and WWF UK. Horsell Common sandpit, site of the landing of the Martians in H.G. Wells' The War of the Worlds. Woking has a Wellsian Martian Tripod, designed by Michael Condron, which was unveiled in April 1998. The tripod celebrates H. G. Wells's book, The War of the Worlds, which was written in Woking. The Tripod is 7 m (23 ft) tall. The legs are 17 cm (7″) in diameter. There are three parts of the sculpture: The Tripod, Bacteria, and the cylinder the tripods came to Earth in. The Martian is also shown advancing from Horsell Common. Another piece of public art is a Hawker Hunter jet fighter mounted on a pole roughly ten metres tall, outside the Big Apple family entertainment complex. This is the last Hunter built and was used to promote the previous Planets family entertainment complex. Originally black, the plane is now finished in all-over silver. The plane was removed in July 2018 due to Health and Safety reasons and the Borough Council gifted the plane to the Hawker Association for restoration at Dunsfold Park. The association are aiming to have it back on display in Surrey by 2019 although a final destination is yet to be announced. Woking is home to an arts and heritage centre called 'The Lightbox'. The modern structure, between the Basingstoke Canal and Victoria Way, was designed by architects Marks Barfield, the architects of the London Eye. The Lightbox contains many hands hanging from the ceiling, a brief history of Woking and many other exhibitions. Notable past exhibitions include a Wallace and Gromit exhibition and a Leonardo da Vinci exhibition. The Lightbox also has the Ingram collection on a long-term loan. The Ingram collection is a selection of paintings and sculptures owned by Woking Football Club owner and local businessman Chris Ingram. In December 2014 the council announced that it would establish a task group to explore potential twinning opportunities with the emerging markets of Brazil, Russia, India, China and South Africa. Woking has a modern shopping centre called The Peacocks and an older shopping area, Wolsey Place. The Peacocks Centre underwent development work in 2010 to add a new façade in the town square. An extension was added that consisted of adding glass with coloured lights that change in sequence. The Peacocks and Wolsey Place have, at present, been joined by means of a covered walkway to complement the town centre's redevelopment. In commemoration of the Queen's Diamond Jubilee, the town square has been renamed "Jubilee Square". The main area for evening entertainment is around Chertsey Road which contains restaurants serving a number of cuisines such as Indian and Chinese. There are also numerous bars and pubs along Chertsey Road as well as several nightclubs around the area. The Ambassadors cinemas and New Victoria Theatre can be accessed via the top floor of The Peacocks. Woking has an indoor swimming pool, "Pool in the Park", and a separate leisure centre at Pool in the Park, opposite Woking Leisure Centre. Outdoor facilities include a skatepark (which is popular with local children), tennis courts, five-a-side football pitches, a cricket pitch (during the summer), bowling greens, a crazy golf course, and a children's adventure playground. These leisure facilities are in Woking Park. Woking also has the largest public library in Surrey. Woking is also to home to the Surrey History Centre, which holds archives and records about the county. In literature, Woking (or, more precisely, its suburb Horsell Common) is where the Martians first land, in a planned invasion of the earth, in the science fiction novel The War of the Worlds (1897–8). The novel's author H. G. Wells was living in Woking when he wrote the book, and much of the early story is set in the area. In 1938, with the action transferred to Grover's Mill, New Jersey, the novel was adapted by Orson Welles as a radio drama in the United States, and caused confusion and panic among listeners who believed that an actual Martian invasion was in progress. In music, "Town Called Malice" was written about Woking by Paul Weller and recorded by his band The Jam. The song reached No. 1 in the UK Charts. The tallest completed building in Woking is Export House, known locally as 'The BAT Building' (Pronounced 'B-A-T' or 'Bat'), from the initials of its first tenant, British American Tobacco. It is 73 metres (240 ft) tall, and has peregrine falcons nesting on top. A series of taller buildings are currently under construction. Monument Road runs from the far end of Maybury Road to the Addlestone Road, and lies just inside the Woking side of the Woking-Sheerwater boundary. It is commonly thought to be so named because of the Muslim Burial Ground established for Muslim Indian soldiers who died in the service of the British Empire in the Great War of 1914–1918. The cemetery no longer contains graves, the corpses having been interred in the Pakistani cemetery close to the mosque, however the walls, entrance and corner towers of the cemetery still remain intact, and they bear a clearly oriental Indian style. The cemetery is set well back from the road and remained hidden until surrounding woods and shrubbery were pruned and thinned. "Early in the 17th century Sir Edward Zouch obtained the Manor of Woking and gained permission to demolish the old palace site. He used some of the material to build a new house – Hoe Place (now a private school) – with some of the Tudor bricks apparently being used in buildings such as The Old House in OLD WOKING and 'The Monument' – a tower that once stood on the hill where the Hoe Bridge Golf Course is today. It was Sir Edward's grandson, Sir James Zouch, who obtained the Market Charter for Woking in 1661, with the Market House (opposite the entrance to Church Street) being built in 1665." Woking railway station is on the Alton Line, Portsmouth Direct Line, South Western Main Line and West of England Main Line. There are frequent trains to and from London Waterloo (via Clapham Junction), a journey taking approximately 25–30 minutes. There is also a twice hourly Waterloo–Woking stopping service that calls at many stations between Waterloo and Woking. Gatwick Airport can be accessed via Guildford railway station or Clapham Junction. London Heathrow Airport has no direct train services from the south west of England, so a RailAir service operates between Woking and Heathrow. A canopy costing £2.8 million was built between the station and the main shopping area of the town. It was approximately 34 metres (112 ft) in length and 22.5 metres (74 ft) in width, stretching from the railway station entrance (town, platform 1, side) to Albion House. The project included landscaping and the provision of a new way to the town from the railway station. This canopy has since been removed. Rail Accident Investigation Branch has one of its two operational centres in Woking. Woking is accessible from the M25 motorway (junction 11), the M3 motorway (junction 3) and the A3. The main access road is the A320 between Guildford and Staines, which passes through the town centre and connects to the M25 to the north at a point close to its M3 junction, and to the A3 to the south at Guildford; further direct roads more immediately connect the west and east parts of the borough respectively to the M3 and A3 respectively. A RailAir coach service is run by National Express, connecting Woking railway station and London Heathrow Airport, in the absence of a direct train link to Heathrow. The bus services in Woking are mainly operated by Abellio Surrey and Arriva Guildford & West Surrey. Arriva Guildford & West Surrey provide the short-distance to services to the surrounding towns and villages, such as West Byfleet, Byfleet, Camberley, Weybridge and to Guildford. Abellio Surrey provides services to more distant towns including into Greater London. These include Staines, Addlestone and Heathrow T5. The Bustler community transport service, which operates from bases Westfield and St John's, uses a fleet of minibuses to serve people with a transportation disadvantage. The Basingstoke Canal, completed in 1794, passes through the north of the town and is crossed by several footbridges and road bridges. The Lightbox, an Art Gallery, is sandwiched between the canal and Victoria Way, a dual carriageway. The canal underwent restoration in the 1960s, 1970s and 1980s with the restoration completed on 10 May 1991. Infant and junior schools in the area include Barnsbury Primary School, Beaufort Primary School, Bisley C of E (Aided) Primary School, Broadmere Primary School, Goldsworth Primary School, Greenfield School, Hoe Bridge School, Horsell C of E (Aided) Junior School, Horsell Village School, ISL Surrey, Kingfield School, Knaphill Junior School, Knaphill Lower School, Maybury Primary School, New Monument Primary, Pyrford C of E (Aided) Primary School, St Dunstan's Catholic Primary School, St Hugh of Lincoln Catholic Primary School, St John's Primary School, St. Andrew's School, Sythwood Primary School, The Hermitage Junior School, The Oaktree School and Westfield Primary School. Secondary schools in the area include: Hoe Valley School, Bishop David Brown School, Gordon's School, St John the Baptist School, The Winston Churchill School, Woking High School and Fullbrook School. Woking College is in Old Woking and provides post-16 education. There are also Private (Independent) Schools. The Surrey campus of the International School of London is in Woking.. This is an independent school for local and international boys and girls aged 2-11. There are several private preparatory schools in Woking: Hoe Bridge, St Andrew's, Greenfield, Oakfield School and Ripley Court are all mixed, while Halstead School is girls only. Woking used to be home to the Oriental Institute until 1899. 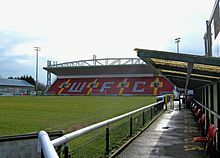 Woking has a football club, Woking F.C., that competes in the National League South (tier 6). The Borough also supports three clubs playing in The Combined Counties Football League (tier 9 and 10): Knaphill FC, Sheerwater FC and Westfield FC. Woking Hockey Club women's first XI compete in the English Hockey League Women's League 1 (tier 2); the men's first XI compete in a regional league. The club has two AstroTurf pitches next to a clubhouse based in Goldsworth Park. Woking also has a number of cricket clubs including Old Woking CC, Woking & Horsell CC, and Westfield CC. It is also home to Pyrford Cricket Club. Founded in 1858, Pyrford is one of the oldest cricket clubs in Surrey. Woking comes under North West Surrey CCG administered and run by the NHS. Fifteen GP practices together with Woking Community Hospital serve the local residents' primary healthcare needs this includes its walk-in centre but the hospital mostly works in the areas of community rehabilitation and neuro-rehab in the Ted Bradley Unit. Specialist hospitals nearby are St Peter's Hospital, Chertsey (for A&E) and Royal Surrey County Hospital in Guildford. Nuffield Hospital is Woking's main private healthcare provider. Woking for about 35 years its own hospital with maternity and A&E amongst other departments. Woking Victoria Hospital abutting Victoria Way, Chobham Road and the Basingstoke Canal, from 1950. Just outside Woking Town Centre there is a walk-in hospital, there is not an A&E department, but will deal with minor emergencies. The main hospitals in the area are St. Peter's Hospital, Royal Surrey County Hospital and Frimley Park Hospital. There is also a Village Medical Centre in Send. Woking has a Coroners Court and a Police Station, which is housed in a former school. In the area there are smaller police stations. Nearby, in Guildford and Surrey Heath there are two prisons: a Category C prison and a women's prison. Chris Ingram Businessman, Entrepreneur and Former Chairman of Woking F.C. ^ The LNC earned additional revenue from golfers disguised as mourners taking advantage of the Necropolis Railway's fixed cheap fares to travel from London to the golf course, a practice which was tacitly accepted by the LNC. How the golfers concealed their equipment while travelling is not recorded. ^ "Borough Boundary Review Council Size Submission" (PDF). The Local Government Boundary Commission for England. p. 9. Retrieved 7 April 2016. ^ "Hot Spot: Woking". The Independent. London. 14 April 2004. Retrieved 1 February 2013. ^ "Surrey County Council census data" (PDF). Archived from the original (PDF) on 16 June 2013. Retrieved 1 February 2013. ^ Birch, W. de Grey, Cartularium Saxonicum, 3 vols., London, 1885–93, no.133. ^ Domesday Book. 1086. Archived from the original on 22 June 2012. Retrieved 22 June 2012. ^ "Woking's crematorium and cemeteries". Woking Borough Council Website. Woking Borough Council. Retrieved 22 June 2012. ^ Ahmad, Nasir. "Dr. Gottlieb Wilhelm Leitner (1840–1899) Builder of the Shah Jehan Mosque, and founder of the Oriental Institute, at Woking, Surrey, England". Ahmadiyya Anjuman Isha'at Islam Lahore (U.K.). Retrieved 22 June 2012. ^ a b "Woking B.C. statutory Conservation Areas". Woking.gov.uk. Retrieved 1 February 2013. ^ "Hoe Valley Scheme". Woking Borough Council. Retrieved 5 February 2012. ^ "Woking". BBC News Online. 19 April 2009. Retrieved 13 February 2011. ^ Harman, Emily (10 May 2010). "Lib Dems and Tories spar for seats in Woking". getsurrey. Retrieved 12 February 2011. ^ "Woking Park Fuel Cell" (PDF). Retrieved 1 February 2013. ^ a b Brown, Paul (26 January 2004). "Woking shines in providing renewable energy". The Guardian. London. Retrieved 11 June 2012. ^ "Taxi emissions ruling set for January start". Woking News & Mail. 18 October 2013. Retrieved 17 December 2013. ^ a b "Estate development survey was a fix, say residents". S&B media. 6 September 2007. Retrieved 25 August 2010. ^ "Barnsbury residents to have a say on new housing development". Woking Borough Council. 29 December 2006. Retrieved 25 August 2010. ^ "Formal statement by Cllr Philip Goldenberg". Woking Borough Council. 16 April 2007. Retrieved 25 August 2010. ^ "'Garden grab' scheme shelved". S&B media. 30 January 2008. Retrieved 23 August 2010. ^ Clarke 2004, p. 23. ^ Brandon & Brooke 2008, p. 99. ^ Clarke 2006, p. 151. ^ "Country of Birth (UV08)". Neighbourhood Statistics. Office for National Statistics. 9 November 2004. Retrieved 14 June 2012. ^ a b "2001 Census area profiles – Woking" (PDF). Surrey County Council. Archived (PDF) from the original on 15 June 2012. Retrieved 15 June 2012. ^ "Exploring Surrey's Past – Use Exploring Surrey's Past to help you find out more about your local history and archaeology". Exploringsurreyspast.org.uk. 24 January 2013. Retrieved 1 February 2013. ^ "Pakistanis in Woking". The Guardian. London. 23 January 2006. ^ "Dr Gottlieb Wilhelm Leitner (1840–1899), builder of the Shah Jehan Mosque, and founder of the Oriental Institute". Wokingmuslim.org. 24 May 1912. Retrieved 1 February 2013. ^ Wachman, Richard (17 November 2011). "Cameron opens McLaren's £50m sports car plant". The Guardian. London. Retrieved 12 June 2012. ^ "McLaren's Woking supercar factory opened by David Cameron". BBC News. 17 November 2011. Retrieved 12 June 2012. ^ Morton, Andy (4 August 2016). "Anheuser-Busch InBev sweeps away SABMiller in new-look leadership team". Just Drinks. Aroq Ltd. Retrieved 1 February 2017. ^ "Hunter T7 XL 623 Rescue Project". Hawker Association. Retrieved 1 November 2018. ^ "The Lightbox website". Thelightbox.org.uk. Retrieved 1 February 2013. ^ a b c d "Woking Town twinning". The Woking Town Twinning Association. Retrieved 19 July 2013. ^ "Taxi On the verge of an international unity". Woking News & Mail. 14 December 2014. Retrieved 19 December 2014. ^ Woking Shopping. "Wolsey Place web site". Wolseyplace.co.uk. Retrieved 1 February 2013. ^ "Pool in the Park web site". Freedom-leisure.co.uk. Retrieved 1 February 2013. ^ "Woking Park web site". Woking.gov.uk. Retrieved 1 February 2013. ^ Batchelor, John (1985). H. G. Wells. Cambridge University Press. pp. 23–24. ISBN 978-0-521-27804-1. ^ a b "Woking Surrey Online: War of the Worlds". Wokingsurrey.com. Retrieved 1 February 2013. ^ Cruz, Gilbert (30 October 2008). "A brief history of Orson Welles' War of the Worlds". Time Magazine. Archived from the original on 22 June 2012. Retrieved 22 June 2012. ^ "''Town Called Malice/Precious reached no. 1 in UK". Thejam.org.uk. Archived from the original on 3 March 2016. Retrieved 1 February 2013. ^ a b "High-flying residents in penthouse roost – The Wokingham Times". getwokingham. 7 June 2007. Retrieved 1 February 2013. ^ "BBC Surrey ''In pictures: View from the top of the Hogs Back'', slide 4". BBC News. 30 November 2009. Retrieved 1 February 2013. ^ "Area Info – An introduction to Woking's heritage – Woking through the ages – 17th/18th Century Woking". Waterfalls. Retrieved 1 February 2013. ^ "Department for Transport travel plan: Annexes." Department for Transport. Retrieved on 19 October 2010. "They have offices in Woking and Derby." ^ "About us." Rail Accident Investigation Branch. Retrieved on 19 October 2010. ^ "Arriva Surrey bus network" (PDF). Retrieved 1 February 2013. ^ "Abellio Surrey network" (PDF). Retrieved 1 February 2013. ^ "Woking Bustler web site". Wokingbustler.org.uk. Retrieved 1 February 2013. ^ "International School of London". Ofsted. Retrieved 1 February 2013. ^ 5 February 2013 – 19:30. "Nuffield Hospitals, Woking Community hospital". Nuffieldhealth.com. Retrieved 1 February 2013. ^ "Listed in the National Archives". Nationalarchives.gov.uk. Retrieved 1 February 2013. ^ Abrahamian, Ervand (4 April 2013). "Revolutionary Iran: A History of the Islamic Republic by Michael Axworthy". Times Higher Education. Retrieved 13 June 2015. ^ a b c d e f g h i j k l m n o p q r s t u v w x y z aa "Hall of fame". Woking Borough Council. Retrieved 21 May 2008. ^ "Biography". Susiedent.awardspace.com. Retrieved 1 February 2013. ^ Wells, Dominic (14 August 2008). "Heels before swine in Ben Charles Edwardss The Town That Boars Me". The Times. London. ^ Rylands, W.H; Songhurst, W.J. Ars Quatuor Coronatorum. ISBN 9785873023493. ^ "Elizabeth Lynne - European Parliament MEPs". Retrieved 22 September 2016. ^ "Ian Ogilvy". Ian Ogilvy. Retrieved 1 February 2013. ^ "Woking – Surrey town". Surrey-online.co.uk. Retrieved 1 February 2013. ^ Wolf, Matt (23 May 2012). "Rising London Star Tom Mison on Juggling Movies, TV and the Timely West End Comedy Posh". Broadway.com. Retrieved 19 October 2013. ^ "Sam hits the big time in New York". Guildford: GetSurrey. 20 March 2009. Retrieved 15 September 2013. "Woking" . Encyclopædia Britannica (11th ed.). 1911. Wikimedia Commons has media related to Woking. Wikivoyage has a travel guide for Woking.